By elevating the issue of helping others into the central and primary issue of ethics, altruism has destroyed the concept of any authentic benevolence or good will among men. It has indoctrinated men with the idea that to value another human being is act of selflessness, thus implying that a man can have no personal interest in others - that to value another is to sacrifice oneself - that any love, respect, or admiration a man may feel for others is not and cannot be a source of his own enjoyment, but is a threat to his existence, a sacrificial blank check signed over to his loved ones. Comment: In this para we begin to realise that far from solving the problem of ethics, Rand has, just as she did with her proposed solution the "is/ought" problem, entirely missed the point. For obviously our personal interests, and those personal interests of others do not always clash; in fact there is no reason to think that they are not mostly compatible. Thus, where there is no clash of personal interests there are no ethical difficulties. Of the millions of letters about ethical dilemmas written to all the "Dear Abby" type advice columns ever printed, precisely zero will be about where personal interests don't conflict. While Rand may claim that her definition of ethics starts with the way the individual treats himself, that ethics are necessary even to Robinson Crusoe on a desert island, we might rightfully reply "so what?" The way Robinson Crusoe behaves only affects Robinson Crusoe; and unless we take it upon ourselves to care about him there is nothing much more to say. Thus Rand's diversion of ethics away from conflicts of personal interests produces a solution without a problem. The men who accept the dichotomy but choose its other side, the ultimate products of altruism's dehumanising influence, are those psychopaths who do not challenge altruism's basic premise but proclaim their rebellion against self-sacrifice by announcing that they are totally indifferent to anything living and would not lift a finger to help a man or a dog left mangled by a hit-and-run driver (who is usually one of their own kind). Comment: This para is a good example of Rand's quite blatantly bamboozling the reader - and quite possibly herself too. Somehow extreme egoism - someone who wouldn't even make the sacrifice of lifting a finger to help a man in a hit-and-run accident - is a product of altruistic ethics?? A completely self-interested psychopath doesn't "challenge altruism's basic premise"?! Pull the other one, as the Cockneys used to say, it's got bells on. While Rand may claim that her definition of ethics starts with the way the individual treats himself, that ethics are necessary even to Robinson Crusoe on a desert island, we might rightfully reply "so what?" This is what makes Objectivism a major departure from conventional systems. Observe that when most people use the word "ethical" they almost always mean what you do in regards to others. While this is appropriate in many contexts, it is not the sole aim of ethics. Rand's great achievement was reclaiming the symbolic ground of ethics as the science of guiding your own choices and actions. But is it such an important departure? Sure, Rand says so, but she makes a lot of erroneous claims, such as her "is/ought" solution. After all, one of the first things we should look for with any proposed solution is "what problem is trying to solve? "A man alone on a desert island has lots of problems, but ethical dilemmas are not among them. It seems to me this verbalist extension of "ethics" to mean the way individuals look after themselves leads nowhere - as evidence, I now turn to the many Objectivist forums where standard ethical conflicts are discussed, and where we note no particularly superior level of resolution - thus calling into question whether this "revolutionary" approach of starting ethics in the individual's self-care is anything more than a side-step. After all, looking after one's own interests in a vague, general sense has always been considered a virtue - but hardly a remarkable one! Her point is someone on a desert island has no choice but to be rational, honest, resourceful, intelligent, self-aware, etc. if he wants to survive. However, people often neglect those attitudes living among other men. In fact, they are just as important among men as they are in isolation. You don't luck into a happy marriage or a fulfilling career. If love, wisdom, happiness, and fulfillment are things you desire, you need to attain them by specific means. In addition to reclaiming ethics as a system of self-guidance, Rand also championed character in a world that is generally hostile to it. Honesty is not, as Greg writes in ARCHN, only a good idea if you aren't a good enough judge of character to know who to swindle. It is a good idea for anyone endeavoring to lead an honorable and proud existence. Your comments are thoughtful as usual. However, I offer you three challenges to them. 1) Firstly, the man stuck on a desert island has to be especially rational and resourceful to survive is true, but this is hardly an ethical issue - rather the classic example of someone summoning all their resources in a crisis situation. 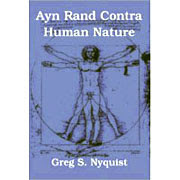 Though this person might behave admirably, I think this should not be confused with solving ethical problems (finding edible food or building safe shelter is hardly in the domain of ethics); for we might see similarly admirable personal qualities emerge in a collective situation like a group of miners trapped below ground, qualities that have little to do with anything original to Rand's philosophy. Further - since when is intelligence an ethical issue? And honesty? I think a lot of people in crisis situations tell themselves all kinds of fibs to keep them going. For a fictional example, take Tom Hank's character in "Castaway", who befriends a volleyball! Is that being "honest" with yourself? And so on and so forth. Now, we might talk about a "work ethic" I suppose, which will certainly help a person succeed, but there is very little in the nature of a difficult dilemma in this as it relates to an individual alone. Someone either wants to work hard, or doesn't. You write: "However, people often neglect those attitudes living among other men." It may be true that people often act differently in crisis situations than they do in their everyday lives, but there is no reason to suggest altruism is the cause of this. It could be equally argued that people can become very petty when comfortable and set in their routines - familiarity breeding contempt - and that the shock of a sudden crisis (such as being stranded on a desert island) makes life more meaningful to them. It often shakes them out of complacency, and makes them see the bigger picture. Far from this making them more individualistic, surviving these sorts of tests often makes them more altruistic. 2) You write: ..."Rand also championed character in a world that is generally hostile to it." I'd also challenge this assertion - in fact I think it is simply a piece of Randian hyperbole. The world in general is not "hostile" to character at all. People who demonstrate good character are almost universally admired. Character references are essential for any important job. Etc etc. Like many other intellectuals, one of Rand's tactics is often to denigrate the world as it currently is - thus making the adoption of her particular philosophy seem more urgent as an answer to all these supposed problems. Errata:I meant to write in para 1 above "And honesty on a desert island?" Rand starts this essay out like she does many other. She takes one extreme (ultra-selfishness, not willing to help someone in a car accident) and the opposite (extreme altruism, your self-interest counts for nothing). If those are the only two options, then who wouldn't want to be an Objectivist? I don't think that the world is hostile to character. I think it is hostile to success. How often you hear people gloat about the troubles of celebrities. Envy is probably the unspoken motivation for much of what people do and think. It could be equally argued that people can become very petty when comfortable and set in their routines - familiarity breeding contempt - and that the shock of a sudden crisis (such as being stranded on a desert island) makes life more meaningful to them. It often shakes them out of complacency, and makes them see the bigger picture. That is very likely the case. That's why I take inspiration and guidance from Objectivist ethics that, comfortable as I may be today, I will only sustain it by my own awareness and will. I take from it essentially "You're not where you are by accident. Keep that bigger picture in mind." Interestingly, I think what you described is why Americans are apathetic about their freedoms being taken away. A study done a few years back said 1/3rd of high school students thought the First Amendment "went too far", for example.